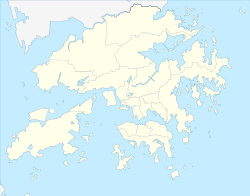 Tung Wah Group of Hospitals Yau Tze Tin Memorial College (Chinese: 東華三院邱子田紀念中學) is an aided secondary school in Hong Kong. Fully subsidized by Government of Hong Kong, the day school is located in Siu Hong Court, Tuen Mun, New Territories. The grammar school is the tenth secondary school established by Tung Wah Group of Hospitals, the oldest and largest charitable organization of Hong Kong, in 1982. ^ "30th Anniversary of TWGHs Yau Tze Tin Memorial College | Tung Wah Group of Hospitals". www.tungwah.org.hk. Retrieved 28 May 2017. This Hong Kong education topic article is a stub. You can help Wikipedia by expanding it. This page was last edited on 2 July 2017, at 17:23 (UTC).